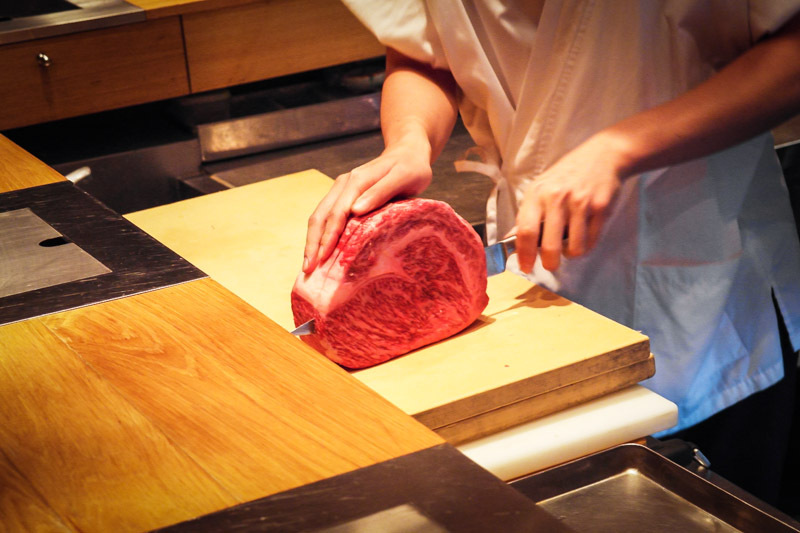 Fat Cow is an upscale Japanese steakhouse in Singapore serving luxurious bespoke meats, with a leaning focus on Japanese Wagyu beef. 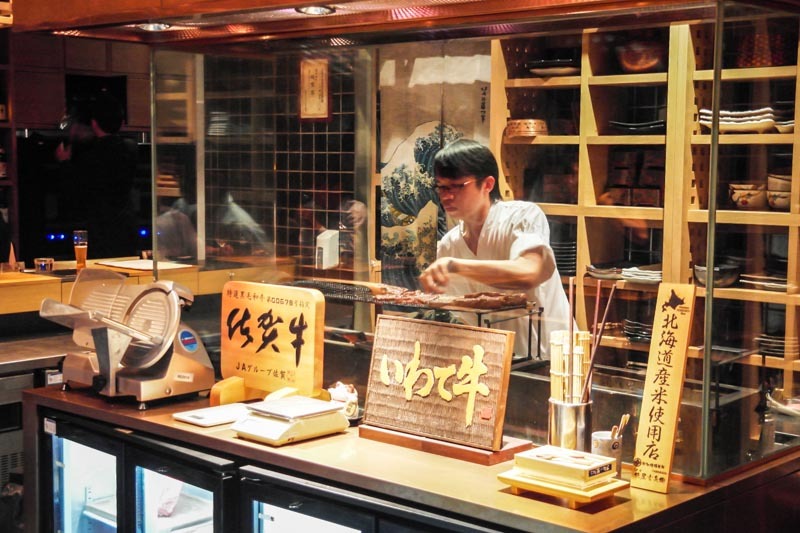 This exclusive steakhouse not only serves an exquisite range of raw, cold and hot starters, but is also well-known for their omakase experience. One of the most exclusive steakhouses in Singapore, it was like striking 4D getting a private media invite to Fat Cow which I gladly took up. 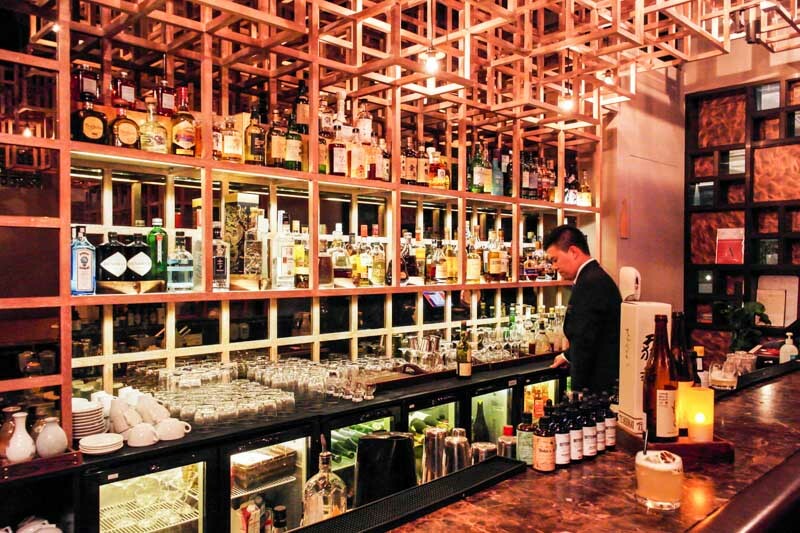 From the lounge bar to the dining area, Fat Cow’s interior is a contemporary take on the traditional Japanese steakhouses with elements of wood and shimmy bronze woven together seamlessly. The design approaches the Japanese “Wabi-Sabi” concept – the art of finding beauty in the simple things. Fat Sour ($16). Suntory Kakubin whisky shaken till frothy with fresh lemon juice, mole bitters and Fat Cow’s homemade Suntory Malt syrup. I started off the night with Fat Cow’s version of the appetizing Whisky Sour, the Fat Sour, which had a good full body from their malt syrup. 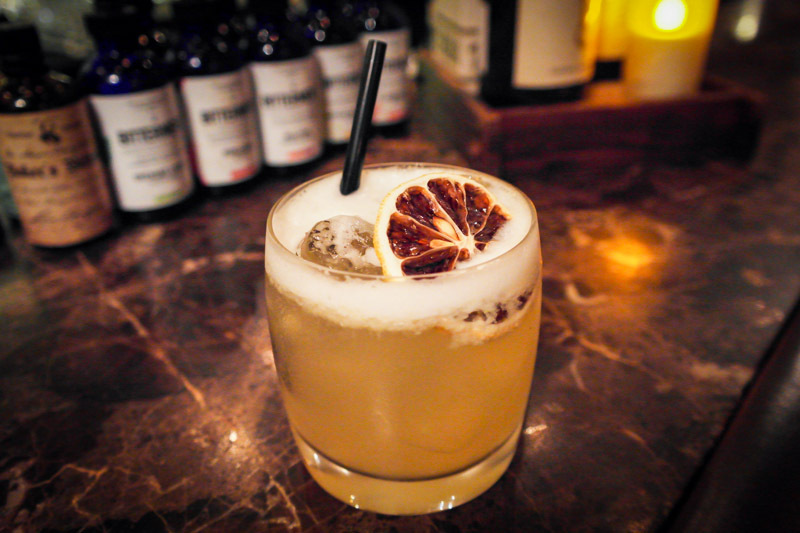 Sour and sweet beautifully melded together by whisky, this is definitely one of the best whisky sours I’ve had. Walking into the dining hall, you see an open stage for the skilled chefs to work their magic with the finest ingredients. 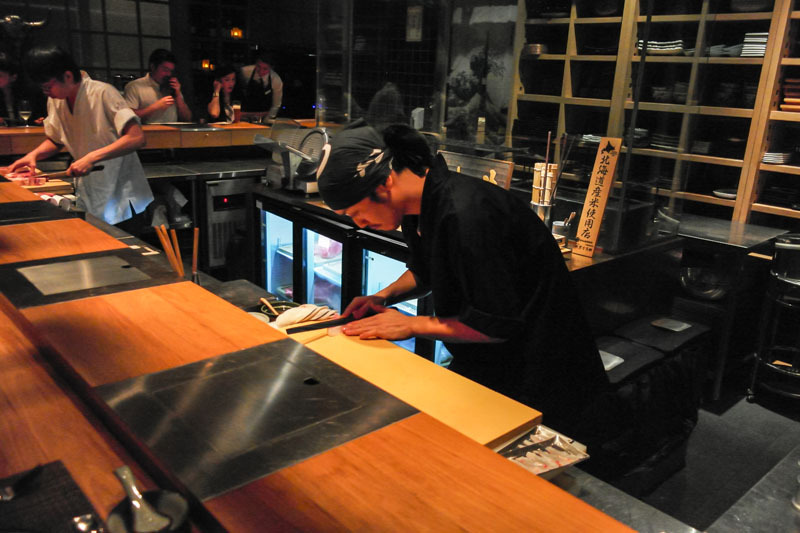 Open kitchens are always the most entertaining to experience. 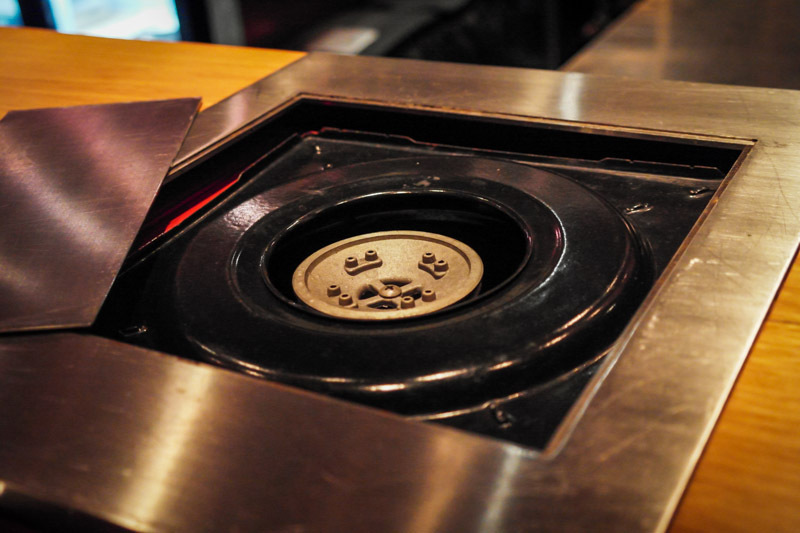 The metal covers on the counter can be removed to reveal a built-in stove for the shabu-shabu hotpot if you order it. High grade, fatty Wagyu from Saga, Iwate and Ohmi prefectures of Japan along with Australian and US cuts are also available. The Japanese wagyu is what Fat Cow is famous for though, so I wouldn’t be picking any other region of beef here. Like going to the Karaoke and not having drinks, it wouldn’t make sense. Just looking at the intense amount of marbling on the wagyu beef we were about to eat created a mini saliva reservoir on the table. Let’s see how creative the chefs can get with the beef. 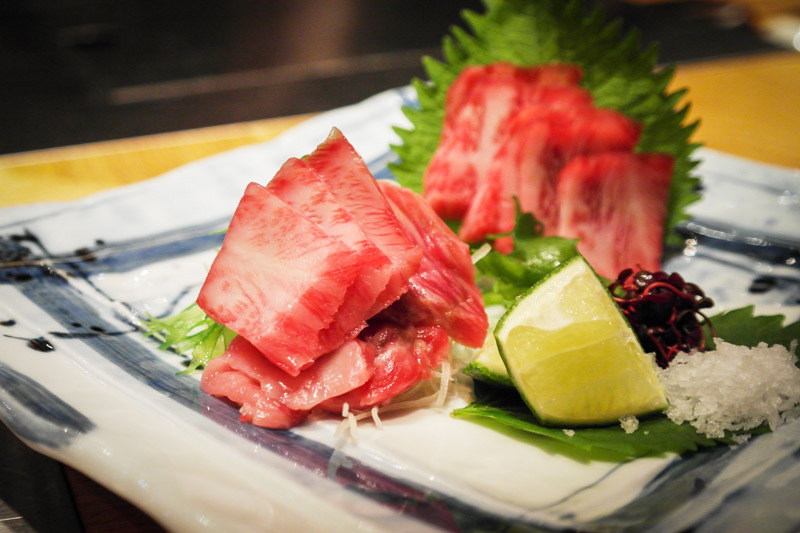 Wagyu No Sashimi To Sudahi-Shio ($48). For the beef purists, there is no better way to enjoy wagyu than with this simplistic sashimi cut. Raw cold cuts are paired with citrus sudachi (much like a Japanese lime) and sea salt. Try it with just the salt, which has a firm buttery bite, then squeeze some sudachi to really experience a change in flavour. The acidity breaks down the protein and makes it extremely soft with a velvety texture. Eat it fast or it gets too mushy though. Amazing beef sashimi experience. Maguro Shoyu­‐Zuke To Moromi Miso Tofu ($24). 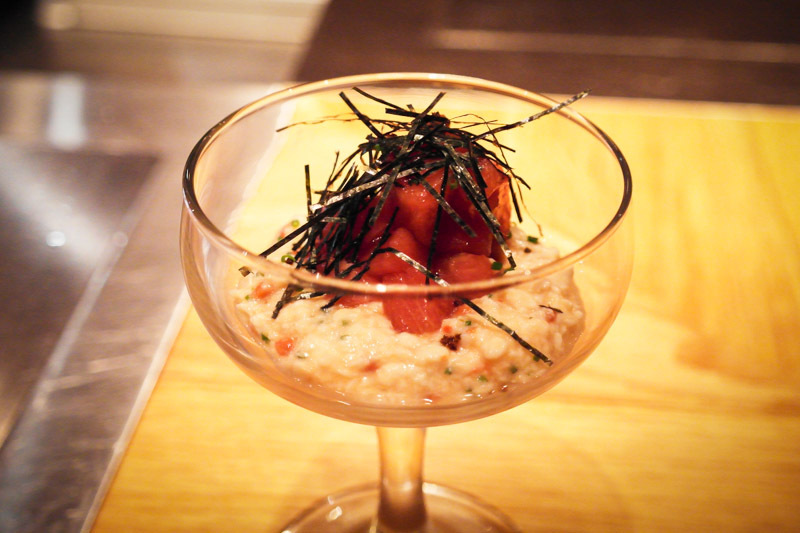 Soy-soaked cubes of maguro tuna serve over mashed up bean curd with fresh ginger juice and barley miso. If you’ve been reading my reviews, you’ll realize I’m not the most ardent fan of tofu, but the tuna, miso and ginger covers up the tofu’s soy taste perfectly as well as adds that delicate touch to the tuna for a sublime starter. Onsen Tamago No Gyu ‘Marrow’ Furai ($16). The dashi broth has a hint of citrus that dampens the fried bone marrow so you don’t really taste that heavy gelatinous flavour when you bite into the soft exterior. 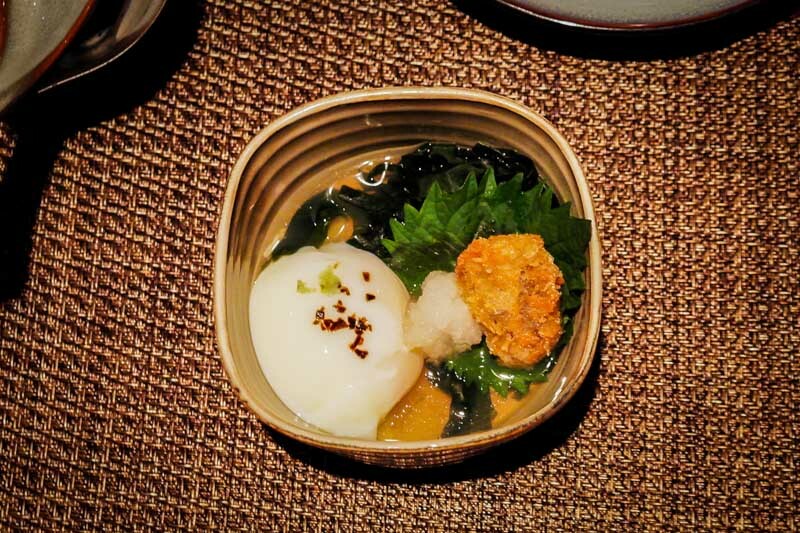 The perfectly slow cooked onsen egg adds further texture play on the entire dish making it a simple, homely dish. Ebi ‘Carabineros’ No Shioyaki ($25 for 1, $65 for 3). Touted as the world’s tastiest prawns originating from the deep seas of Spain, it’s hard to argue against that when I’ve never had tastier prawn in my life. Simply char grilled with salt, this huge scarlet carabineros prawn has intense sweet flavour and absorbs the smokey char from the binchotan amazingly well. 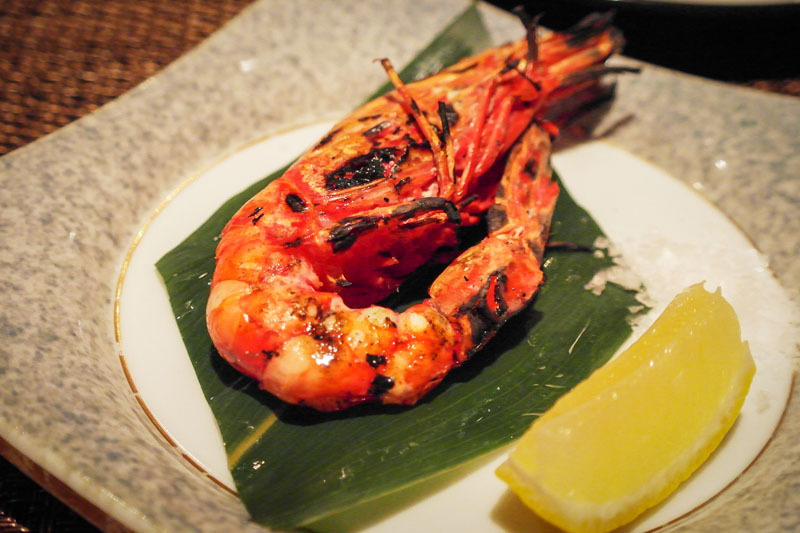 The savoury umami head with all its gooey essence was the highlight for my tastebuds and you wouldn’t want to miss it since you’re paying $25 for a prawn. Better slurp it all up or pass it to me. Staring hungrily at the chefs grilling steak, you occasionally see that burst of flames emerging from the grill when the fat drips into the charcoal, reinvigorating the meat with more smokey flavour. Ohmi A4 Ribeye ($120 for 150g), Iwate A5 Ribeye ($148 for 150g), Saga A3 Tenderloin ($89 for 110g). This was a tasting platter of the 3 different wagyu meats at half the actual serving size. We opted for the Sumibyaki grill style of cooking. You can also have the beef done in Shabu-shabu or sukiyaki. Premium Japanese steak is grilled over bichotan (white charcoal) and is served with sea salt, ponzu ginger and a special yuzu pepper sauce. Maesawa Wagyu cows from the Iwate prefecture face more extreme seasons and the cow gets fatter to bear the cold and also has a more pronounced and contrasting taste from the muscle development. 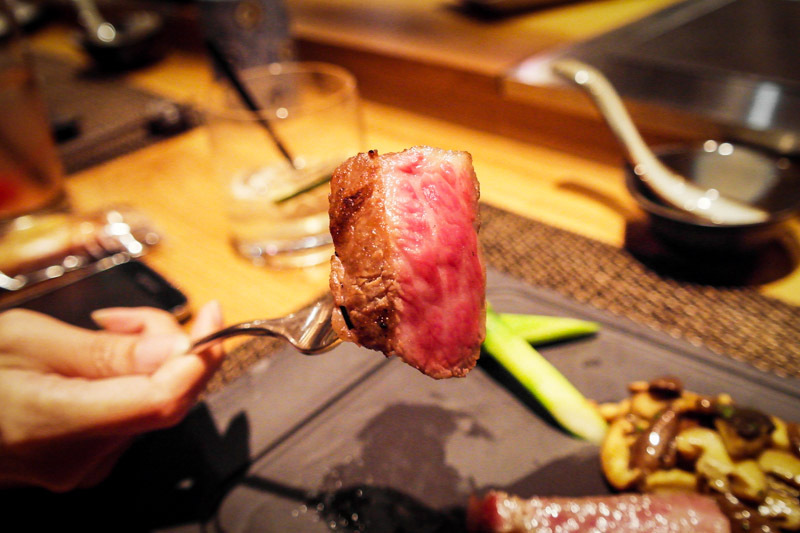 A5 wagyu is usually a bit too heavy for my taste, and the Iwate one had varying chunks of fat. 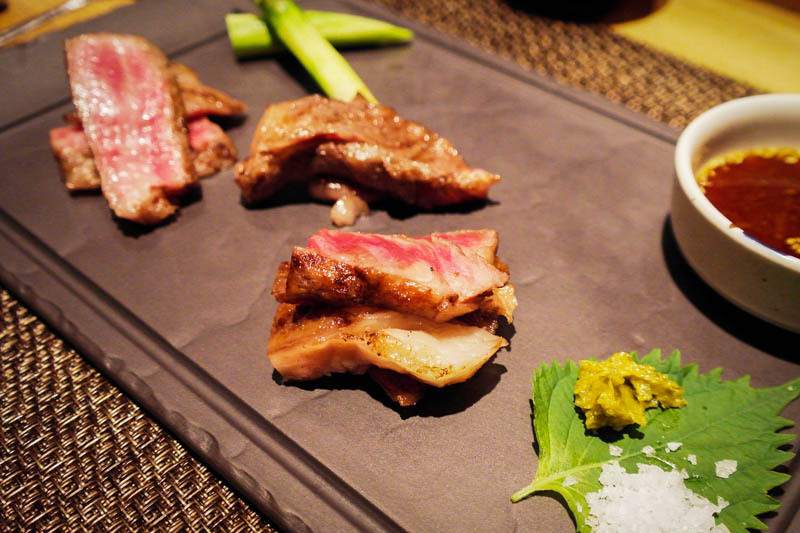 Saga Wagyu comes from a milder climate though, thus the meat is more unified and even. A good robust flavour that many people will like as well. 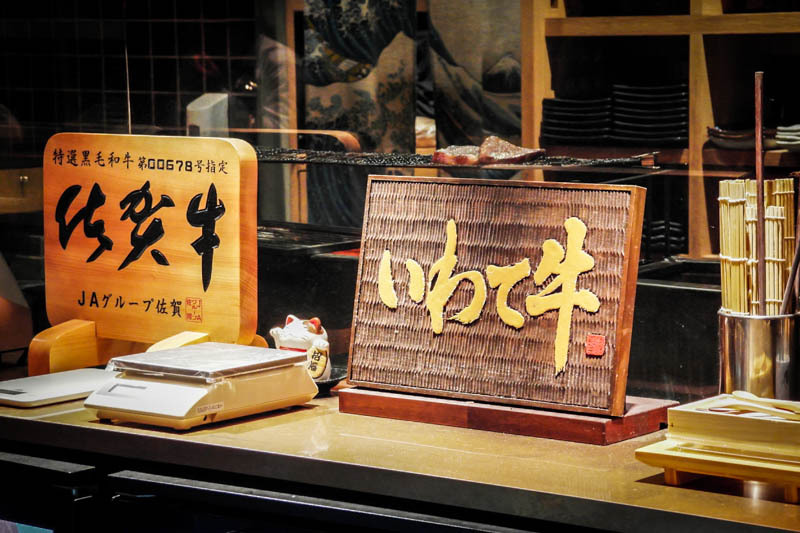 Ohmi Wagyu from the Shiga prefecture is the only breed that has fat with viscocity that melts at lower temperatures and is the meat of choice to the Japanese royal family. This A4 breed was my favorite with the best balance. 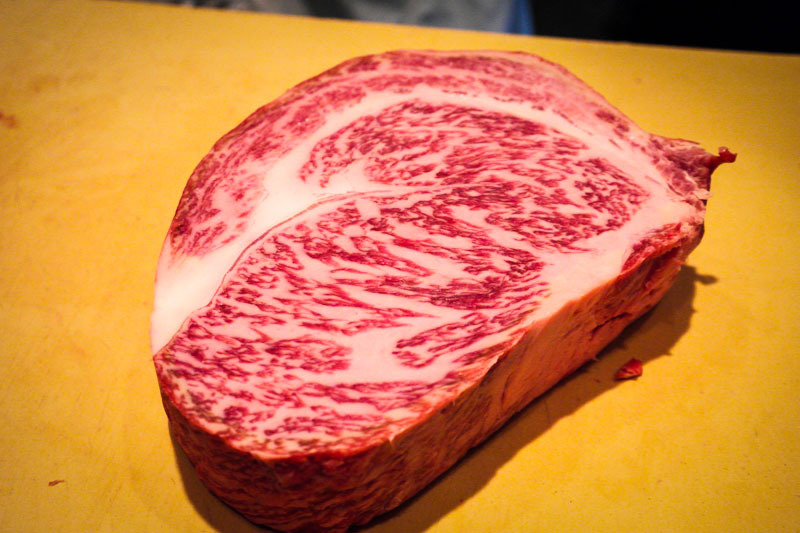 In the end which wagyu meat to get is a personal preference, and the most expensive is not always the best for you. There is also a Butcher’s selection (from $99 for 125g), which features different secondary cuts of Japanese wagyu daily for something a bit different. We also had some sides, like obviously all that we had previously wasn’t enough. Kinoko ($15). 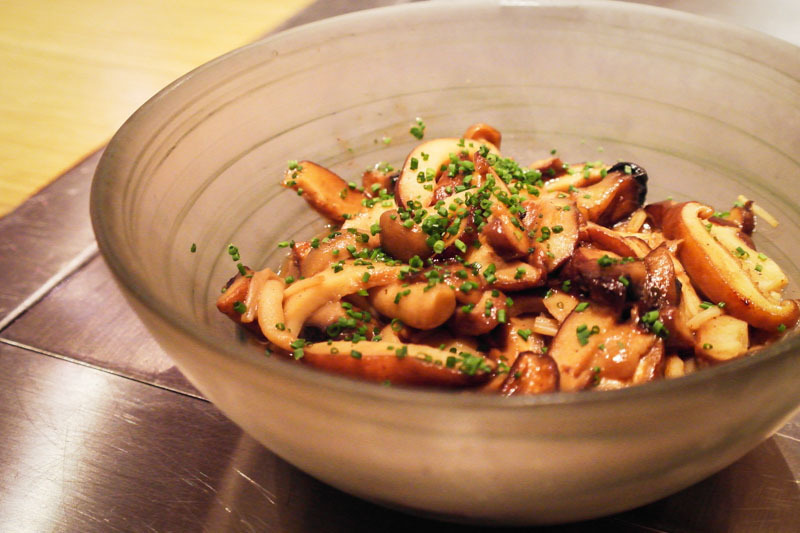 An assortment of Japanese mushrooms braised with sake, lime and butter. Simple mix with some acidity from lime and body from the sake. Satsumaimo No Goma-Tare ($14). 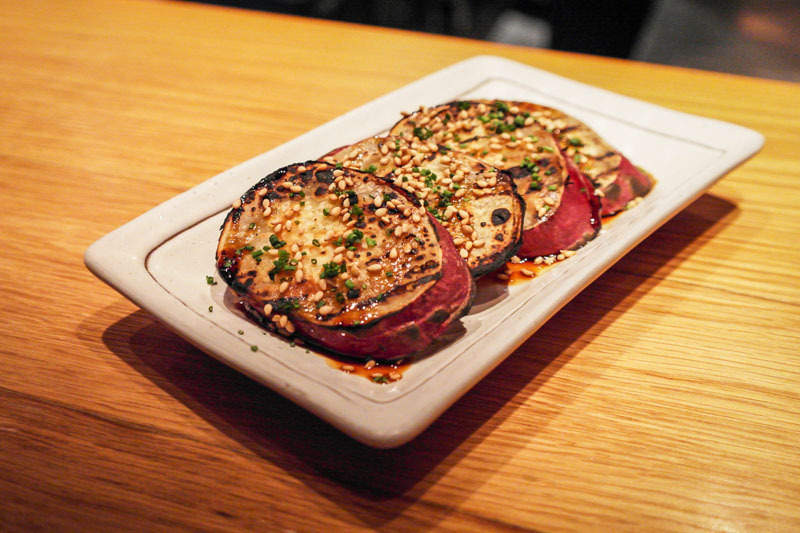 Grilled Japanese sweet potato with sesame and chive. As usually, vegetables/fruits/roots out of Japan are always unbelievably sweet. Gyu-Niku Dashi Zosui ($12). Rice porridge with egg in a mushroom-beef broth. 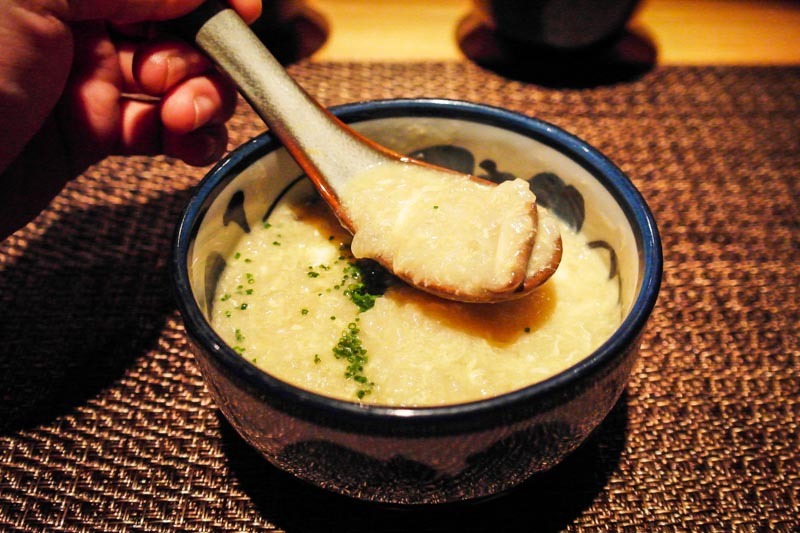 An absurdly comforting porridge with sweet beef stock and just the right watery consistency. There are wagyu fat trimmings added in, which explains how such a simple bowl of porridge can taste like the nectar of the cow Gods. The next time I would probably put this dish at the start of the meal to really blow my mind without feeling so stuffed already- if I found it this good when I’m full, it’s going to be amazing when I’m hungry. Warabi Mochi ($18). 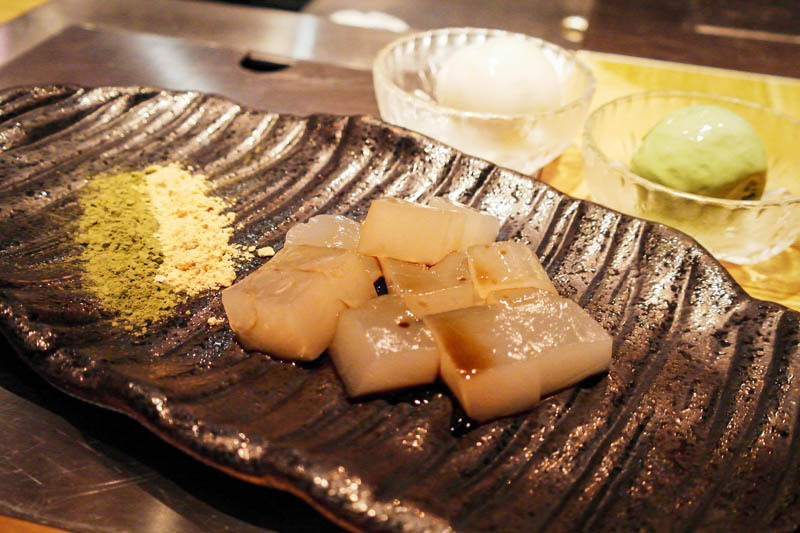 House made warabi mochi seasoned with green tea and roastes soy bean flour. Soft and light without being overly artificially bouncy, this was a nice end to the meal. Amber Macallen. 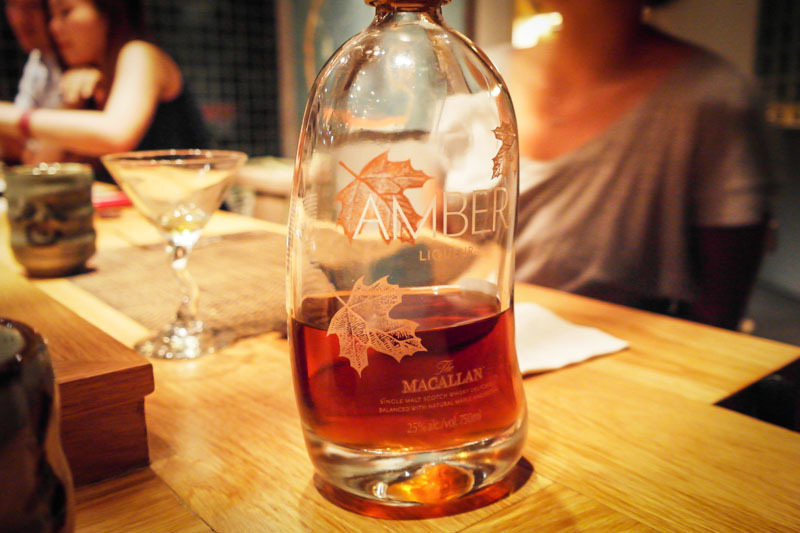 A sweetened maple and pecan flavoured limited edition whisky that Fat Cow’s boss bought off an auction. As of this writing, there are only 5 left in the entire Singapore which are sold in Fat Cow. Although the dinner menu isn’t exactly a casual affair, Fat Cow’s set lunch menu is pretty worth it for their quality. Some items I would definitely eye is the Bara Chirashi ($35), The Fat Cow Donburi ($39) and Spicy Salmon Donburi ($26). 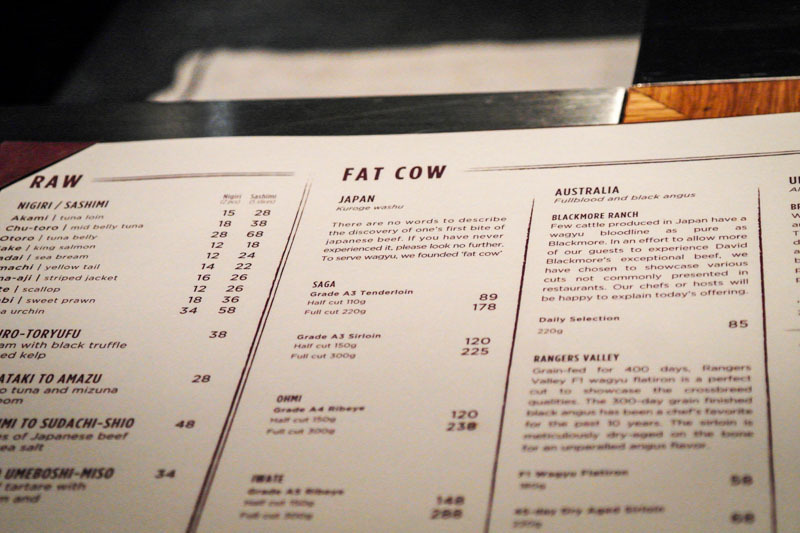 Fat Cow’s ethos of serving a bevy of original small dishes packed with bold flavours and focusing on Japanese Wagyu beef is something really special. 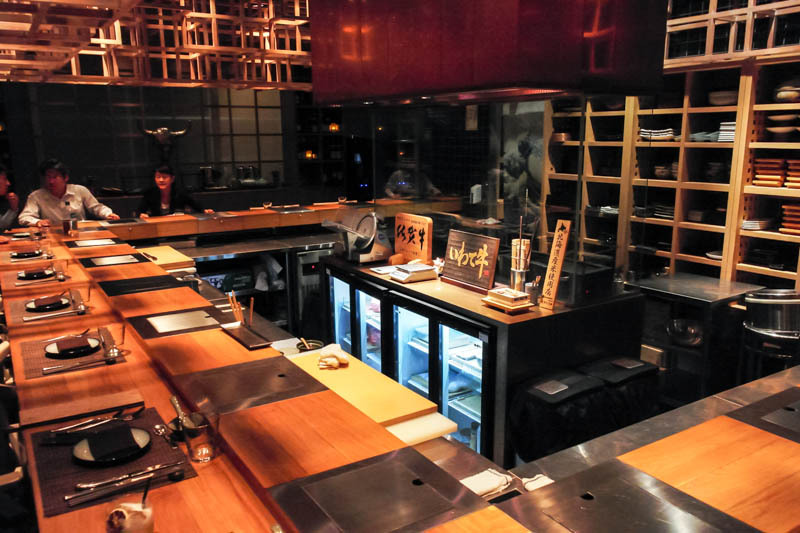 With the option of an omakase experience, no two meals here will be the same experience. 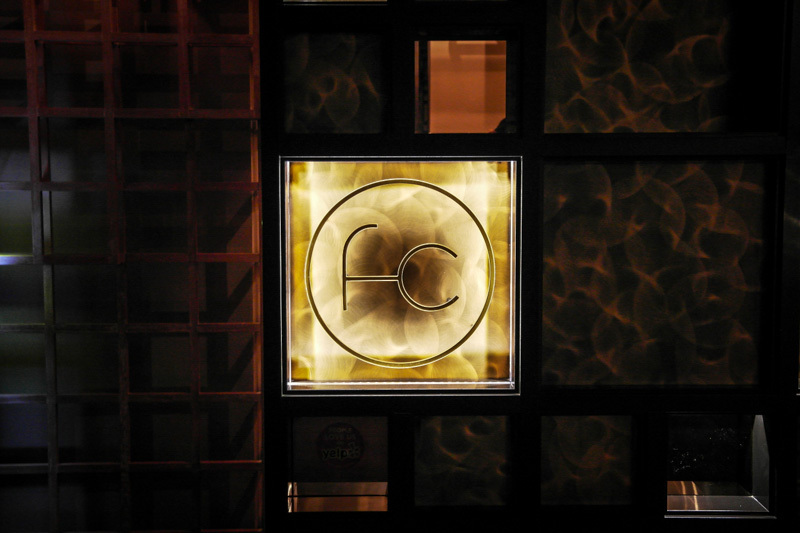 With exceptionally high quality, Fat Cow is –the– premium place to go for authentic Japanese Wagyu steak.